Cinders is a stunning, domestic short-haired, tortoiseshell female cat.Cinders and her rellies are former members of a fast food dumpster rat patrol squad. 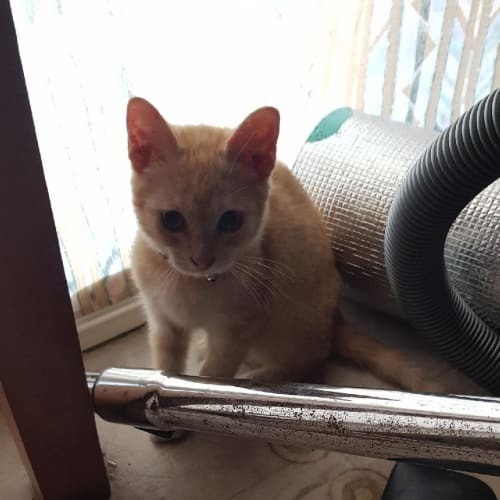 She and her siblings were discovered as frightened little kittens, darting back and forth to the bins from behind a power generator at a local shopping complex. 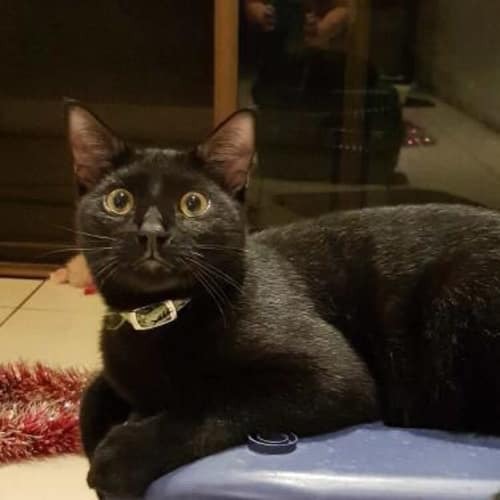 A concerned customer spent many months sitting with them, providing food and play in attempt to earn their trust and grow their confidence before finally succeeding in bringing them into the safety her home at about 10 months of age. Since being in foster care, Cinders has adapted to domestic life very well, and surprisingly fast. Although she spends most of her time hanging out in a cat-run during the day, she loves exploring the enclosed yard with her family and fellow fosters in the evening, sometimes taking a cheeky tour through the house; when the resident cocker spaniels aren’t too close that is! (eek scary!). 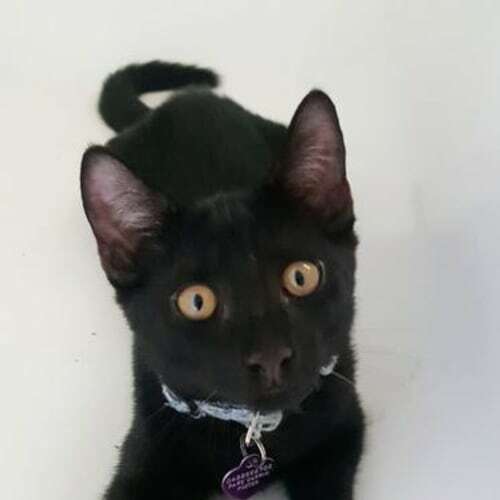 She is quite a playful young lady and will very happily chase a string around for ages. She also loves to chill out in the peace and quite of her enclosure, cuddled up to her sister Pip on their favourite hammock. Cinders has also become quite the smoocher and loves interaction with her foster carer. She loves a good pat, and will roll around in front of her carer, purring all the while, but she is not used to being picked up and handled. 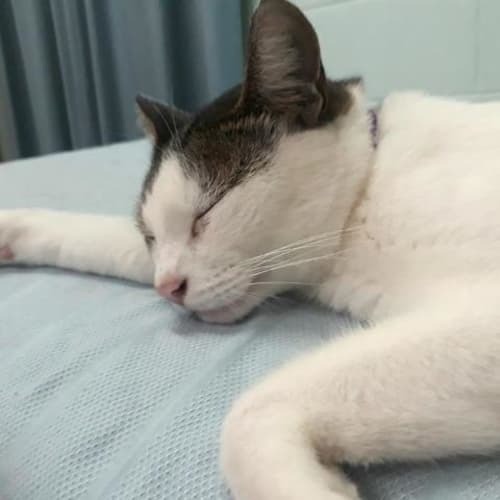 She just loves a good strong scratch all around her head and back, and will show her gratitude by pulling her carer’s hand to her face with her paw to give intermittent purr fuelled “love bites” during her “deep tissue massage”. 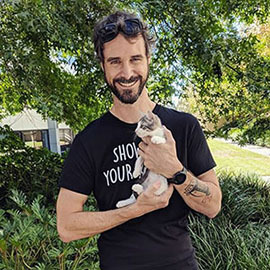 Once she’s comfortable, Cinders loves to be the centre of her human’s attention and, true to nature, will quickly display her sassy fortitude (with a bit of a hiss or slap) towards other cats if they try to steal her spotlight. It’s important to note though that, due to her background, Cinders is still is still very wary of new people and so can be a bit shy and skittish. As such, while you’re getting to know her, she requires you to be softly spoken and move a little bit slower around her, especially when seeking a silky soft pat. She is also still quite afraid of her carer’s dogs and small children, but is comfortable enough around them if they keep their distance. Cinders would flourish in a peaceful environment where she feels safe and secure. She needs someone who is kind, loving, and most of all patient. 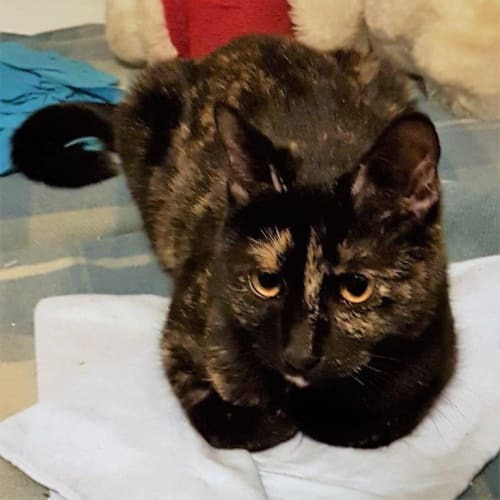 Whilst she has grown up as a part of a colony, Cinders seems to prefer one on one contact with her human, so will be best as the only cat in her new home. 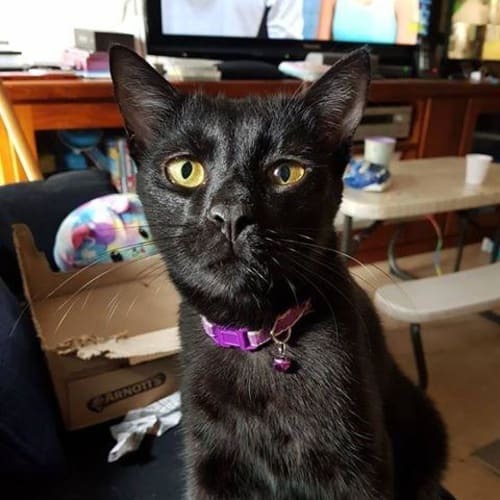 She would be the ideal companion for a soft, gentle individual or couple (no children) looking to nurture this little girl and watch her blossom into the beautiful companion her carer knows she will become.Cinders comes vaccinated, microchipped, desexed, wormed and flea treated. 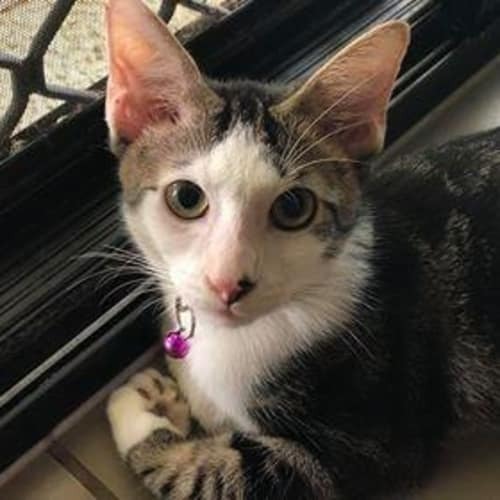 Brandon is an affectionate and playful kitten. Enjoys human company and cuddles.Will make a great addition to any family. Pippen (Pip) is a stunning, domestic short-haired, marbled ginger tabby; and she’s a GIRL! You will be hard pressed to find another female ginger moggie with a stunning coat pattern like Pip’s! Boys sure, but we’ve never seen another girl like her!Pip and her rellies are former members of a fast food dumpster rat patrol squad. 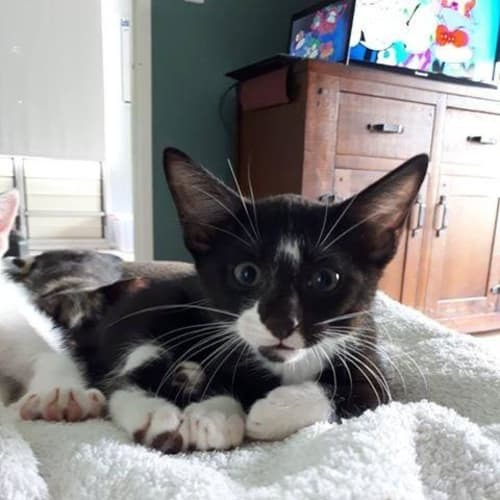 She and her siblings were discovered as frightened little kittens, darting back and forth to the bins from behind a power generator at a local shopping complex. Pip the tiniest little weed of a kitten, perhaps the runt of the litter. 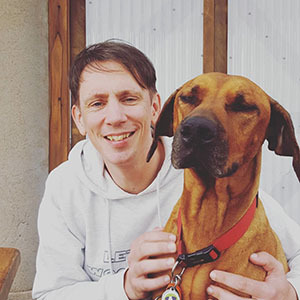 A concerned customer spent many months sitting with them, providing food and play in attempt to earn their trust and grow their confidence before finally succeeding in bringing them into the safety her home at about 10 months of age. Since being in foster care, Pip has gradually been coming out of her shell little by little each day. Whilst not quite ready for pats and cuddles, she will very happily sit nearby and watch as you go about your day, and particularly loves it if you drag around some feathers on a string for her to chase; she will play for ages! When the opportunity arises, Pip also loves exploring the enclosed yard with her fur family and fellow fosters in the evening, sometimes taking a cheeky tour through the house; when the resident cocker spaniels aren’t too close that is! (eek scary!). Otherwise Pip spends most of her time chilling out in the peace and quite of her enclosure, often cuddled up to her sister Cinders on their favourite hammock. Pip is very much adjusting to domestic life. Still very wary of new people, Pip is quiet, shy, and easily startled by loud noises and sudden movements. As such she is looking for special person with patience and understanding; someone who is willing to give her the time, space, and love she needs to gain her confidents. Pip will flourish in a peaceful environment where she feels safe and secure. Since she has grown up as a part of a colony, Pip is very comfortable around other cats, and seems to draw confidence from them. She would probably do best with a feline companion, ideally one of her siblings. 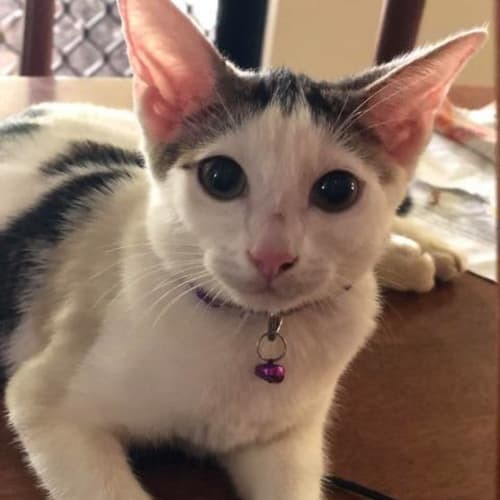 She would be the ideal companion for a soft, gentle individual or couple (preferably with no children or dogs) looking to nurture this little girl and watch her blossom into the beautiful companion her carer knows she will become. 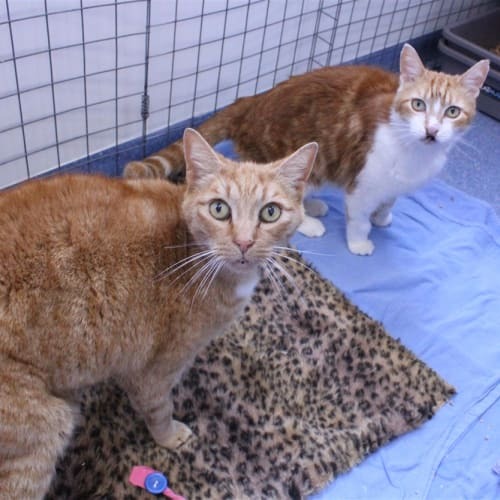 Hi, our names are Bomber and Ginger Megs, we were brought to the RSPCA as our owner could no longer care for us, we are a bonded pair and we need to find home that will be able to take both of us, as we are brothers our lives would not be the same without each other. When we arrive at the shelter, we were itchy and it was discovered I had a ulcerated upper lip, so I have been under treatment for fleas and allergies, we are both on a special diet that is helping keep our allergies at bay. 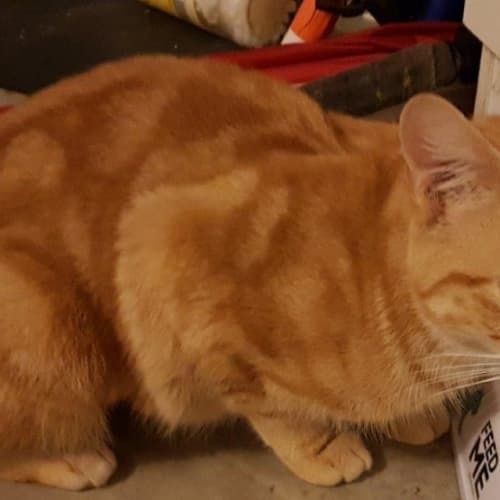 Ginger Megs also had Gingivitis and has had a few teeth removed, he is also feeling a lot better too, we are no longer in pain and we are enjoying our new lives.We are sweet boys, if you feel we could be a perfect match to your life, come down to the shelter and have meet with us. 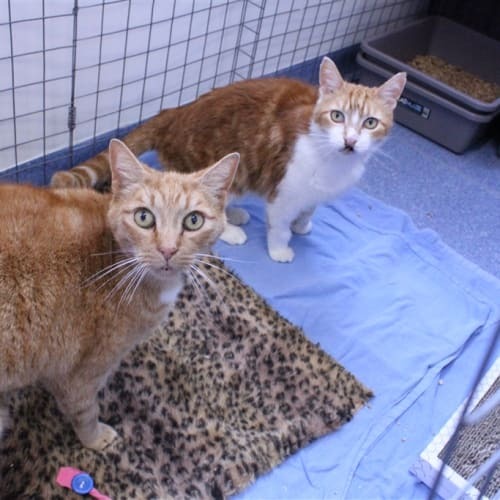 Hi, our names are Ginger Megs and Bomber, we were brought to the RSPCA as our owner could no longer care for us, we are a bonded pair and we need to find home that will be able to take both of us, as we are brothers our lives would not be the same without each other. When we arrive at the shelter, we were itchy and it was discovered I had a Gingivitis and I have had a few teeth removed. Poor Bomber had an ulcerated upper lip, so we have both been under treatment for fleas and allergies, we are both on a special diet that is helping to keep our allergies at bay, we are feeling a lot better and we are no longer in pain and we are enjoying our new lives.We are sweet boys, if you feel we could be a perfect match to your life, come down to the shelter and have meet with us.